Actimetrics specializes in automated systems for video-based animal behavioral research and analyses. Emphasis is placed on ease of use and the application of modern signal and image processing techniques to achieve a high level of validity and reliability. Dozens of features designed for high throughput data collection and analysis benefit large and small users alike. ClockLab and ClockLab Analysis are the most sophisticated and easy- to-use system available for data for Circadian Biology studies. As the clear industry standard, ClockLab combines a point-and-click interface with state-of-the art algorithms. Embedded controls transform each graph into a powerful and interactive tool for data analysis. Measure phase shifts in under 30 seconds with our fast and simple to use ClockLab program. Applied to mice, hamsters, rats, drosophila, humans, bees, algae, Eurasian Lynx, squirrels, gopher turtles, horseshoe crabs and soil chemistry signals from the Mars Viking Lander, this system really is the most flexible available on the market. Integrated light control and light recording at 1-minute precision into each data file � no need to guess about blown bulbs, accidental chamber openings or faulty, misprogrammed or inaccurate light timers! Lights are controlled in up to 96 different animal chambers independently using the simple menu and slider control panel. With ClockLab, simply past actograms and other plots into your presentation graphics programs like PowerPoint, Illustrator or Photoshop � each graph is completely editable. Actograms are zoomable for easy navigation through long files, just drag on an interesting part of the actogram, zoom in, and then click to display the periodogram, FFT or activity profile for the chosen data segment � it is that simple! Export all data and analyses to spreadsheet files. Data can be accessed in many ways � thought ClockLab, Stanford Software�s Chronobiology Kit, Actiwatch, Dataquest, Minimitter, Trikinetics and others. The first video-based system for fear conditioning, FreezeFrame, has become the standard in its field. Combining the sensitivity of the human observer with the objectivity and throughput of automation, FreezeFrame is able to measure minute movements of grooming, sniffing, turning and rearing. The animal is monitored 2-4 times per second for data that is far more objective and reproducible. FreezeFrame can also be utilized for learned helplessness experiments, including tail suspension test and the Porsolt Forced Swim Test. FreezeFrame is not a tracking system � featuring a proprietary motion detection algorithm, the system filters out shadows, light flicker, and camera noise to detect movements as small as 1 mm. FreezeFrame offers superior performance in low-light and is fully validated, with greater than 90% concordance with trained human observers. Easily store and recall multiple stimulus protocols for training and testing phases. Video images can be stored for future review and also exported as QuickTime and AVI movies for presentation. Batch export of data and analyses to Excel allows for easy analyzing of % freezing, number of bouts, bout duration and intervals for specified periods. Either white noise or pure tone can be delivered through the computer�s sound card. The FreezeFrame system accommodates multiple sounds of different amplitude, frequency and quality throughout a single trial. Stimuli � including lights, external sound generators and/or shock generators are also controlled though the computer. 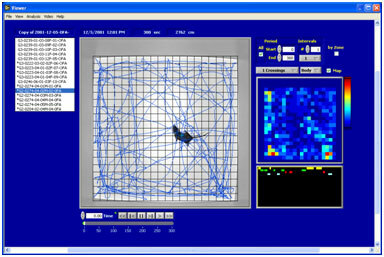 WaterMaze is a unique, video-based tracking system for the Morris Water Maze, designed in collaboration with Dr. Richard Morris which incorporates a novel Project Manager for designing and executing complex experiments with multiple animals, starting points and platform positions. Once the Project parameters are specified by the user, the program specifies each day which animal to run next and which platform, allowing the most complex experiments to be run accurately and efficiently even at the highest throughput trials. Using state-of-the-art image processing software and video-capture card, WaterMaze can acquire images up to 30 frames per second. 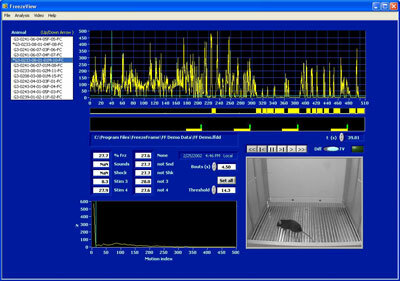 The system identifies whether the animal is lighter or darker than the background and an algorithm screens out shadows and lighting changes during the trial. The path of travel is displayed in real time as the trial proceeds. 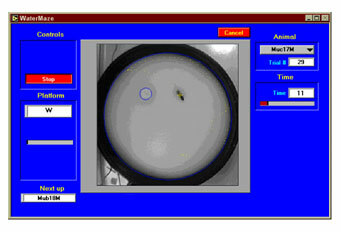 The tracking window, shown below, uses a yellow cursor to show current position and yellow dots to depict the path. WaterMaze offers superior analysis capabilities. Easily view for single or multiple trials and transfer directly from the program to Excel. Selectable animal and trial lists allow for easy scanning of data. Parameters reported in the program are thigmotaxis, Moser�s zones, Whishaw�s corridor, Gallagher�s proximity, quadrant times and crossings and more. Swim paths can be exported to standard drawing programs and movies of each trial can be stored and viewed in the WaterMaze Analysis window or exported to PowerPoint. Developed in close collaboration with behavioral neuroscientists, LimeLight is a flexible and powerful video tracking system for behavioral experiments. Ideal for open field, plus maze, radial arm maze, zero maze, novel object recognition and conditioned place preference, LimeLight is easily adapted to meet the needs of a range of applications. With a complete range of features, our system is very easy to configure, operate and acquire meaningful data. LimeLight easily tracks up to four arenas simultaneously. A single camera can be used for multiple arenas or for greater flexibility; one camera can be used for each arena. Powerful enough to track white or black animals on any background, special lighting is not necessary. Images are collected up to 30 frames per second for a single animal or up to eight frames per second when tracking four arenas at once. Images are compressed and stored for later review and off-line scoring of complex behaviors. Video can easily be exported to AVI or QuickTime format for inclusion in presentations. Our system simplifies zone creation through dedicated interfaces for open field and elevated plus maze testing. A custom zone setup permits unlimited flexibility for more specialized applications with an easy-to-use click-and-drag interface. Zone configurations can be edited during analysis and applied to previously recorded trials. Scored behaviors can be noted by assigning a key stroke or by mouse clicking either during the trial or viewing stored video. Statistics on scored behaviors can be viewed and exported to Excel for analysis. The ACT-120 includes the connectors and cabling for controlling up to four light stimuli in a FreezeFrame Fear Conditioning System. One ACT-120 is required for each FreezeFrame system that employs a visual stimulus. The ACT-130 includes the connectors and cabling for operating up to four House Lights and Isolation Cubicle Fans in a FreezeFrame Fear Conditioning System. One ACT-130 is required for each FreezeFrame system that employs House Lights and/or Isolation Cubicle Fans. The ACT-202 is an adjustable Water Maze platform.